On the 23rd June 1314: The first day of the Battle of Bannockburn near Stirling. An advance manoeuvre by the Earl of Gloucester, the Earl of Hereford and Robert de Clifford, attempting to relieve the siege of Stirling Castle, is blocked by the sturdy schiltron formations of Robert the Bruce’s army. Just before the battle began a young English knight, Henry de Bohun, spotted Bruce in front of his men and decided to charge. 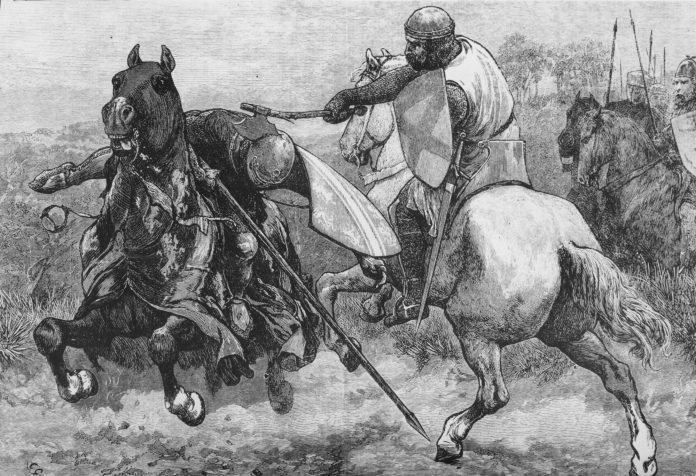 Bruce managed to avoid the lance at the last moment and brought his axe down on de Bohun’s head, splitting it almost in two. Now about the feast of Pentecost [May 26th] the King of England approached the March of Scotland; also the Earl of Gloucester, the Earl of Hereford, the Earl of Pembroke, and the Earl of Angus, Sir Robert de Clifford, Sir John Comyn (son of the murdered John), Sir Henry de Beaumont, Sir John de Segrave, Sir Pagan de Typtoft, Sir Edmund de Mauley, Sir Ingelram de Umfraville, with other barons, knights, and a splendid and numerous army, if only they had had the Lord as ally. But the Earl of Lancaster and the other English earls who were of his party remained at home with their men (except those with whom they were bound in strict obligation to furnish the king in war), because the king as yet had refused to agree with them or to perform what he had promised before. Arid whereas when his noble father Edward went on a campaign in Scotland, he used to visit on his march [the shrines of] the English saints, Thomas of Canterbury, Edmund, Hugh, William, and Cuthbert, offering fair oblations, commending himself to their prayers, and also bestowing liberal gifts to monasteries and the poor, this [king] did none of these things; but marching with great pomp and elaborate state, he took goods from the monasteries on his journey, and, as was reported, did and said things to the prejudice and injury of the saints. In consequence of this and other things it is not surprising that confusion and everlasting shame overtook him and his army, which was foretold at the time by certain religious men of England. Thus before the feast of the Nativity of St. John the Baptist [June 24th], the king, having massed his army, advanced with the aforesaid pomp towards Stirling Castle, to relieve it from siege and to engage the Scots, who were assembled there in all their strength. On the vigil of the aforesaid Nativity [June 23rd] the king’s army arrived after dinner near Torwood; and, upon information that there were Scots in the wood, the king’s advanced guard, commanded by Lord de Clifford, began to make a circuit of the wood to prevent the Scots escaping by flight. The Scots did not interfere until they the English were far ahead of the main body, when they showed themselves, and, cutting off the king’s advanced guard from the middle and rear columns, they charged and killed some of them and put the rest to flight. From that moment began a panic among the English and the Scots grew bolder.